Posted on July 5, 2017 at 2:18 pm. If you’ve been frequenting online casinos for a few years now, you may remember the Lord of the Rings online slot game, which was once considered one of the most popular pokies on the Web. The Lord of the Rings pokies game was pulled off the online casino market in 2012 after the estate of Lord of the Rings creator J.R.R. Tolkien sued Warner Brothers for copyright infringements and contract breaches, claiming the film studio overstepped its rights when merchandising the Lord of the Rings franchise. states the lawsuit was settled out of court this week for an undisclosed amount. It is not clear if a financial settlement was reached, and if so, for what amount and to whom the settlement was paid. 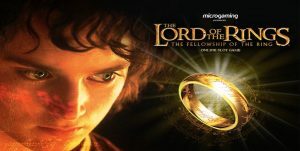 The Lord of the Rings slot game was part of Microgaming’s progressive jackpot pokies network, featuring five rows, three reels and a 243 Ways to Win format. Symbols were made up of beloved Lord of the Rings characters from the Warner Bros film, including Frodo, Sam, Merry, Bilbo Baggins, Legolas and Saruman. It’s four-tiered progressive jackpot bonus structure consisted of a major jackpot with a base value of $1,000,000. When the Lord of the Rings slot game was taken off the market in 2012, Microgaming replaced it with The Dark Knight progressive jackpot game, which used the exact same format but replaced characters and symbols with those from the 2008 Batman film. The Dark Knight online pokies game and its sequel The Dark Knight Rises were pulled from the market in June 2016 after their licenses expired.